In President Schulz’s budget memo sent on October 24, 2017 to Chancellors, Vice-Presidents, and Deans, which I also then shared with you, the President indicated that memos were to be sent to area personnel by November 1 outlining the specific steps being taken to address the spending reductions required of all areas. This is that memo. where the “ * ” in the formula above denotes that this does not include any carry forward funds. Negative run-rates at WSU have been an ongoing phenomenon for the last four years, as depicted by the red bars in the graph below. This has cumulatively depleted the overall reserve balances of WSU substantially, by $115 million, with those reserves being used to pay for the substantial overspending, relative to revenue inflows, that occurred during those four years. 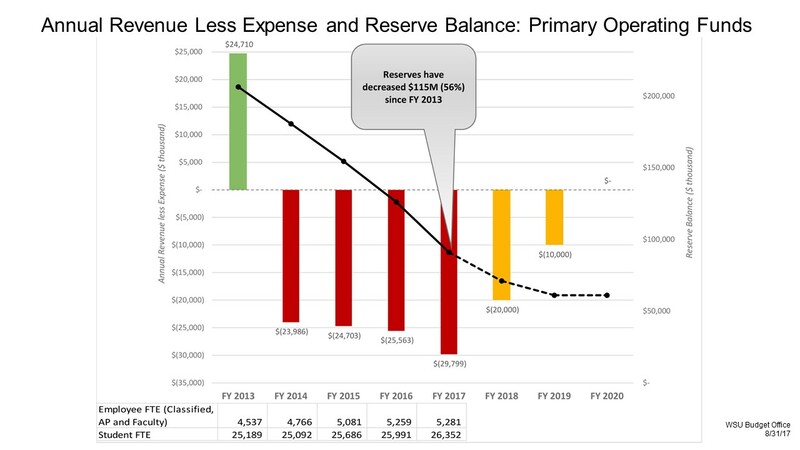 The total reserve balances across fiscal years is depicted by the solid black curve in the graph below. If the negative run-rates were to continue at the rate that occurred this past fiscal year 2017 (FY17, which began July 1, 2016 and completed on June 30, 2017), WSU would exhaust its remaining reserve balances entirely within the next three years, and at that point, continuing such an expenditure rate would simply not be possible – there would no longer be any reserve balances left to use in support of that rate of expenditure, and WSU would essentially be incapable of paying all of its “bills”. It is this reality that the President is addressing with his budget strategy, where he is prescribing successive reductions of three cumulating $10 million per year decreases in the negative annual run-rates to ultimately achieve a zero run-rate by the end of three fiscal year period. The two yellow bars in the graph below, followed by no bars, indicate the planned progressive elimination of the negative run-rates. Note this implies that we will unfortunately continue to experience negative run-rates in the coming two fiscal years (i.e., a negative $20 million run-rate in FY18 and a negative $10 million run-rate in FY 19), and we will thus continue to draw down our overall WSU reserves, but at progressively lesser negative rates. By addressing the budget problem stepwise and gradually, the President is essentially engineering a “softer-landing” of the WSU budget glide path to positive run-rates, preventing a greater shock to the university system that could otherwise result from imposing an immediate reduction in annual expenditures of $30 million per year. To achieve the reductions in WSU run-rates that are required, expenditure reduction targets were assigned to all areas of the university, including colleges, support units, and the athletics program. Area administrators were charged with managing their budgets so as to meet their assigned budget targets, and I will describe ahead the steps taken to date, and those that are planned in CAHNRS to address our budget challenge. I believe it is also useful to briefly review the additional budget issues that were dealt with by the college, and that are part of the CAHNRS financial context prior to the need to address the current university run-rate issue. These serve to underscore that, in the near term, conservatism in budget management is needed to ensure that we can continue to make measured progress on our strategic goals and mission and avoid any abrupt reductions in operations and programs. And rest assured that working collaboratively together, we can achieve this objective. In brief, prior budget challenges included ongoing substantial allocations of CAHNRS funds to support two much-needed salary increase programs at WSU, an allocation of ongoing college funds was directed centrally to support the university’s important Grand Challenges initiative, a $1.7 million dollar transfer from CAHNRS was required to pay the college’s assessed share of the state’s HCA liability, and a new ongoing $350,000 per year maintenance and operations (M&O) cost was assessed and sourced from CAHNRS operating funds to support CAHNRS new plant growth facility. This is in addition to already having begun the implementation of a college debt repayment plan to address substantial financial commitments that were “booked”, mostly for faculty start up packages resulting from implementation of brisk faculty hiring plans in previous years. The cumulative financial effects of these budget issues were substantial, and they served to diminish the capacity of CAHNRS to fund other initiatives. However, please note that the college was, and still is capable of making forward progress, albeit at a more conservative pace, and we do not foresee the need for substantial retrenchment. Turning to the current negative run-rate issue, CAHNRS, as are all colleges and other areas, is required to reduce its rate of expenditures. There has already been considerable progress made on reducing college expenditures in FY17, and efforts will continue to occur in FY18, FY19, and FY20 as part of the college’s contribution to the prescribed reduction in negative WSU run-rates. It is important to underscore here that any dollars “saved” by reductions in expenditures by the college are not being transferred out of the college and to the central budget of the university– those dollars remain in CAHNRS (see the President’s memo), and will be used to support substantial college commitments already outstanding and for college debt repayment. Unit Budget Reductions: Departments/Schools/Areas in the colleges were assigned budget reductions of varying amounts for FY17, and the cumulative total of those reductions amounted to $3.5 million of ongoing decreased expenditures. These funds are being returned to the overall college budget. CAHNRS Retirement Incentives Program: The college instituted a retirement incentives program for interested faculty that will result in the retirement of 25 CAHNRS faculty. Given the timing and incentives involved in the retirement agreements that were reached with faculty who decided to pursue this opportunity, the program is estimated to eventually save the college approximately $2 million annually once all of the retirements occur and faculty incentives are paid during the FY18-FY20 time horizon. Note that the full level of expenditure reduction will be realized only if none of the faculty slots that are being vacated are counteracted by new faculty hiring and the expenses associated with that hiring. To the extent that new faculty hiring occurs, the savings realized will decrease, and expenditure reductions will need to be identified in other ways, from other sources. Elimination of the Director and Assistant Director positions within the CAHNRS Office of Human Engagement (COHE) group. Services performed by the COHE group were consolidated into the Operations and Business Finance Office (BFO) support units of CAHNRS, and a substantial subset of the personnel and HR support services formerly conducted by COHE were contracted out to WSU Central HR. This net result was a significant reduction in expenditures. Reorganization and restructuring of the Business Centers and BFO, with a concomitant reduction in budget and expenditure by these support units. Reorganization of the CAHNRS Communications service unit, with a concomitant reduction in budget and expenditures by the unit. The administrative structures of the Mt. Vernon and Puyallup Research and Extension Centers were consolidated and redesigned into a shared administration mode. Operations at these R&E Centers were analyzed in detail, and alterations in staffing and staffing roles at both Centers were implemented. This resulted in a substantial reduction in expenditures across the two R&E Centers. A portion of the savings that were created by this effort will be largely dedicated, in the near term, to pay down accumulated Center debt. A strategic reduction in force was identified and implemented in the WSU Extension Energy Program through ongoing collaborative interactions between the administrations of the college and the program, resulting in significant expenditure reductions in the program. Revenue Generation Through Sale and Leasing of Land Parcels: Sales of land parcels at both the Puyallup and Wenatchee Research and Extension Centers are currently being actively pursued, subject to approval by the WSU Board of Regents. The amount of revenue that is projected to be generated from these land sales is substantial. A long-term lease of some acreage that is part of the Prosser R&E Center, and that has not been actively used for research by faculty and is also not expected to be used by faculty for this purpose in the future, is being actively pursued. This action was unanimously supported by the faculty at the center, and the lease proposal is being sent to the WSU Board of Regents for approval. Cumulative revenue generation over the coming years of the lease is also projected to be substantial. Elimination of All Negative Account Balances in CAHNRS: The college instituted a program requiring that all negative-balance accounts in all units be returned to zero or positive balances, and has prohibited any additional deficit spending on accounts that currently have negative balances. Negative balance accounts that cannot be returned to positive balances in FY18 require that an explicit plan for restoring the accounts to positive balances be filed with the college. Implementation of End Dates on All College Commitments: CAHNRS has implemented a policy by which all college-funded commitments that do not currently have explicit end dates associated with them will be reviewed, and explicit end dates will be established. The establishment of end dates will be informed through discussions with the individuals or units to which commitments were made. Priority Use of Accruals and F&A Funds: CAHNRS has instituted a policy by which grant accruals and F&A resources must be used to eliminate negative account balances within a faculty member’s program or unit’s accounts before these funds are used for any other purpose. Reduction in College Financial Support for University-Level Centers and Institutes: CAHNRS has historically provided financial support to a number of centers, programs, and initiatives intended to advance general programmatic excellence at WSU. Some recent explicit examples of this type of support include such initiatives as the establishment of the Kamiak high-performance computing facility, CEREO, and the Washington State Water Research Center. Given high priority needs that are more centrally focused on CAHNRS programs and strategic initiatives, this type of financial support is no longer possible within the current budget environment, and these and other support commitments have been, or will be curtailed. Conservative Faculty Hiring Plan: The college has implemented a highly conservative faculty hiring policy for the next three fiscal year periods. All vacant positions are abolished unless otherwise approved. All vacant positions, and accruals associated with them, revert to the College. Decisions regarding whether to fill positions will be made on a case-by-case basis, and in the current budget environment, positions must be critical, their functionality must be impossible to meet in any other way, and the position must be unequivocally necessary for the operation of a program to be considered for approval under the current highly conservative hiring policy. As a point of reference, there has currently only been one “replacement” position that has been authorized to move forward and added to what was already a predetermined slate of open faculty searches that have been ongoing to date. Commitments made to donors who have established endowed chair positions, or who have provided substantial funding to support salaries and startup of faculty positions in critical areas of college functionality will be given special consideration within future conservative hiring plans. Out-of-Cycle Salary Adjustments: The current policy of the college regarding out-of-cycle salary increases is that such requests cannot be considered unless they are in the context of a retention situation. Moreover, in such retention contexts, consideration of salary adjustments will require demonstrable evidence of an active and bonafide offer of alternative employment. The President has assumed the very important and challenging task of navigating the institution back to full financial health. He has prescribed an approach for achieving that objective that is attainable while also pursuing an objective of muting disruptions to the operation and forward progress of the university. By working together to expend funds conservatively and to seek additional revenue sources, we can both address CAHNRS’ contribution to the university’s budget challenge, and support the overall future financial health of WSU. CAHNRS administration asks for your understanding, your support, and team effort in addressing this challenge. We will work hard to minimize negative effects on CAHNRS operations, programs, and strategic goals as much as possible during this 3-year recovery period. Together, we will emerge from this challenge strong, as CAHNRS always has when faced with problems it needs to address, and again be capable of forward progress at a more vigorous pace.